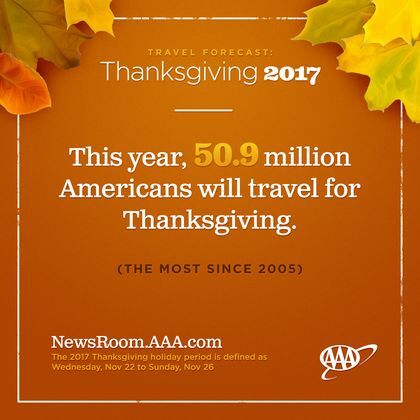 Thanksgiving holiday travelers will total 6.5 million, an increase of 5% from the 6.19 million in 2017. *Mid Atlantic region includes New Jersey, New York, Pennsylvania. Thanksgiving holiday travelers will total 9.99 million, an increase of 4.8% from the 9.5 million in 2017. 9 million will travel by automobile, up 4.9% from last year’s 8.6 million. 718,000 people will fly to their destinations, up 4.7% from the previous year’s amount of 685,000. *South Atlantic region includes DE, FL, GS, MD, NC, SC, VA, and WV. Thanksgiving holiday travelers will total 9.15 million, an increase of 4.8% from the 8.7 million in 2017. 8.15 million will travel by automobile, up 4.7% from last year’s 7.78 million. 752,000 people will fly to their destinations, up 6.3% from the previous year’s amount of 707,000. *East North Central includes IL, IN, OH, MI, and WI. *East South Central includes KY, TN, AL, and MS.
For more detailed information on the Thanksgiving travel forecast, visit AAA.com/TravelCommunity.